The Sydney Morning Herald, 24 January 1998, p.1. The most serious attempt since Federation to change the Australian flag will be launched tomorrow with the unveiling of 100 new designs. The flags were selected from more than 2,500 entries by professional designers in a national competition launched last June by Ausflag, a private organisation committed to a new flag. 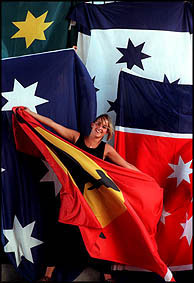 During the next year, Ausflag will ask the public in an informal poll to choose the flag that will be flown at the Sydney Olympics in 2000 and at the Centenary of Federation on January 1, 2001. People can vote to keep the existing flag or for one of the 100 finalists of the Ausflag competition. They can also choose from nine finalists in earlier competitions. At the end of this year, Ausflag will submit three designs to the Federal Government with a request for a national plebiscite similar to the one in 1977 which led to the selection of Advance Australia Fair as the national anthem. The co-chairmen of Ausflag, the former Premier Mr Nick Greiner and the NRMA chief, Mr Nick Whitlam, will launch the public phase of the competition tomorrow at the Museum of Sydney. The guest speaker will be the former ATSIC chairwoman, Ms Lois O′Donoghue, who will call for a flag that symbolises national reconciliation. With the Constitutional Convention to be held in Canberra next month, Australians are entering a period when they will be asked to think seriously about their national symbols as the new millennium approaches. The 100 designs present a mosaic of Australia′s evolution as a nation. The Southern Cross remains the dominant image, appearing on two-thirds of the designs. The growing impact of Aboriginal culture is clearly evident, with 37 per cent of the designs including some element of the Aboriginal flag. Last January, a nationwide Herald-AGB McNair Poll found that 66 per cent of respondents would support using the Aboriginal flag as part of the design for a new national flag. The poll also found a much higher level of acceptance of the possibility of a new national flag than previous polls had. The public can see the flag designs from Monday at the Museum of Sydney. They will also be displayed on the Internet on www.ausflag.com.au. The blue ensign has been the Australian flag since 1901 when it was chosen, along with the similar red ensign, following a national design competition. The blue flag was for government use and the red for private. The blue ensign was proclaimed the official flag by the Menzies Government in 1953.